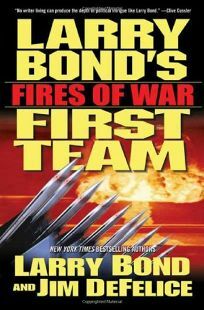 After crisscrossing the Middle East to fight the war on terror in 2006's Angels of Wrath, Bond's elite operatives turn their attention to the North Korean part of the Axis of Evil in this suspenseful thriller, the third in the First Team series. After the North Koreans suddenly and improbably vow to give up their nuclear weapons, inspection teams-infiltrated by First Team member Thera Majed-uncover evidence of missile material in both North and South Korea. It doesn't help that the CIA doubts the reports, leaving team leader Bob Ferguson out on a limb. Majed aids the defection of the North Korean scientist Dr. Tak Ch'o, who alerts the team to a secret alliance between North and South Koreans determined to reunite their country and take nuclear revenge on Japan. Disguised as a Russian arms dealer, Ferguson angles to prevent international disaster. A large cast means numerous shifts of viewpoint, which slows the pace at the beginning, but also helps capture the mutual suspicion and paranoia of covert intelligence operations.